It is common for a spinal disc to heal over time with conservative treatments without a disc replacement procedure. However, surgery may help when all other treatment methods fail when this occurs your surgeon might recommend disc replacement. Degenerative disc disease is caused by the imperfection of one or more spinal discs. When a disc is damaged, typically due to arthritis, it can lead to neck or back pain. The back pain originates from inflammation or muscle spasm. In some instances, pain and numbness can shoot to the arm from pressure. Disc replacement is performed by a surgeon who removes the damaged spinal disc and replaces it with an artificial one. This procedure allows you to continue to move your spine, unlike spinal fusion. Just as orthopedic surgeons have replaced worn-out hips, knees, and other joints in the body, now they have the technology to replace worn-out discs in the lower back (lumbar spine) and neck (cervical spine). These artificial discs are in variable stages of approval by the Food and Drug Administration (FDA). 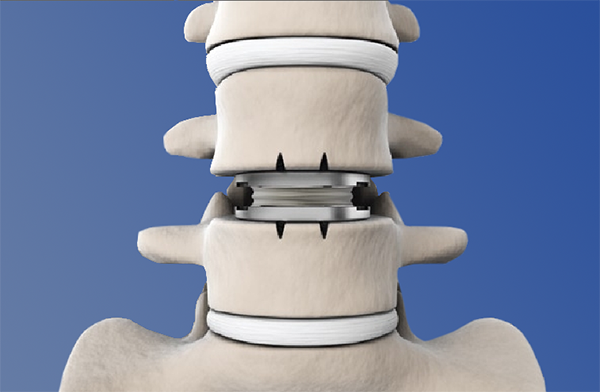 Although European surgeons have implanted artificial discs in the spine for several years with good results, many of the implant devices are still being tested in the U.S.A.
At Spine & Orthopedic Center, our reputation as a leader in total disc replacement is well known, due to the fact we experience patients from all over the world for treatment. Furthermore, our head spine surgeon, Dr. Ashish Sahai – who has a biomedical engineering background – holds several patents for spinal implants and he is also a regular consultant with several spine surgery device companies to design new techniques and implants. How is a Disc Replacement Performed? The disc replacement procedure is performed through the front of your spine. For more information on Disc Replacement or to find out if you are a candidate, call our disc replacement specialists at 1-888-409-8006.